As the snow falls across Europe during winter in the Northern Hemisphere and causes havoc in many major cities, with schools closing and public services freezing to a stand still, it appears despite the great advances in technology and planning within the 21st Century many countries are simply not able to maintain order in such conditions. One only wonders what will happen when the counter effects of Global Warming as the revenge of nature comes into play in the future. Part of the solution is personal knowledge and as every with Hypo Global, we intend to be as useful as possible to help you survive in the 21st Century. So what could be more fitting to cover the topic of “How to drive in a Snow Blizzard” this week. Fundamentally, as often is the case there is no silver bullet one solution. However, by following the below staged advice, you will be better prepared if you find yourself in a snow blzzard somewhere on planet earth this winter. To do this, utilize the heater, wipers and defroster with the aim to keep windows free of condensation. In such an event turn your wheels from side to side repeatedly to push the snow out of the way. 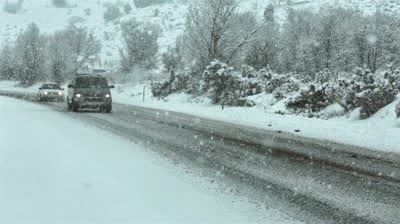 Reduce your speed, but use as high a gear as possible for maximum traction and to avoid skids on snowy and icy roads. For this you need to place potential objects within your realm of use (e.g. a floor mat, bag of kitty litter, a blanket, or clothing) under specifically the drive wheels to gain a traction aid effect. 5. Position people above the drive wheels. Move your passengers if any above the drive wheels position in the car as increased weight over the drive wheels will further help you to gain traction. In a low gear, apply a light pressure on the gas pedal to move as far forward as you can without spinning, then release so you roll back. The car will gradually move forward by inches, eventually gaining enough space to gain traction. If the car is still stuck, instruct passengers to push the car forward. Try rocking the car back and forth, with a well-timed push at the forward point.